Network platforms that integrate transportation carriers, shippers, consignees, and 3PLs can do more than provide transportation and logistics services. The connectivity and end-to-end visibility they provide offers the potential to reduce risks and transaction costs for banks and other lenders, lowering the cost of capital and increasing velocity across the supply chain. See the beginning of the Supply Chain Platform Series: Part 1, the Introduction. We discussed Invoicing and Payment Network Platforms in the previous article in this series. Before we move on to the other two types of network platforms, some context about supply chain finance is helpful to understand the role of these platforms in enabling supply chain finance innovations. 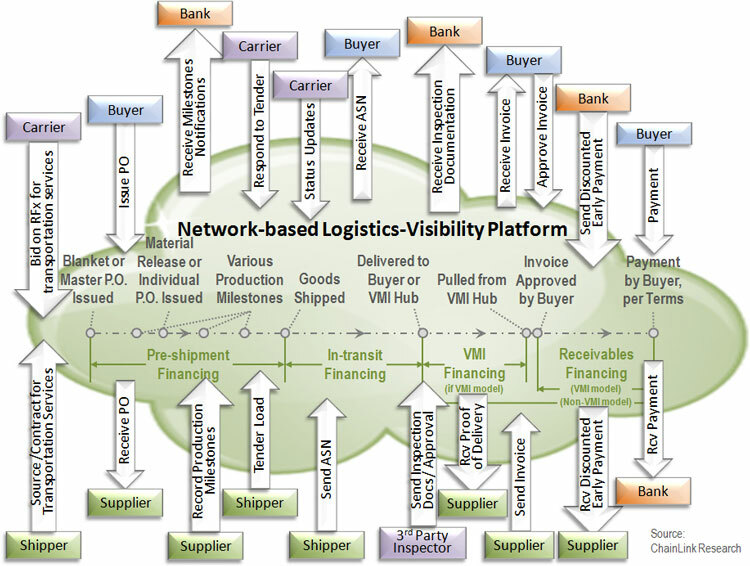 As explained in “Convergence of Physical and Financial Supply Chains,” financing may occur at one or more of the stages in the supply chain, as shown in Figure 1 below. The earlier in the supply chain the financing is provided to the supplier, the greater the risk to the lender, and hence the higher the cost. In fact, without some means of mitigating risk for the lender, many suppliers are unable to obtain pre-shipment financing at all. This is one place that logistics-visibility platforms can play a key role, as explained further below. People may not automatically think of supply chain financing as a tool for compressing lead times, but it can play an important role. For example, merchandisers buying apparel for next year’s fashion typically struggle with long lead times, which force them into a one-time buy—making their best guess at forecasting which styles and colors will be hot next year before they have sold even a single garment within that season. How valuable would it be if those lead times were shortened to the point where the buyer could place a smaller order up front, see what was selling well, and then place orders only for what is actually being consumed? Wouldn’t that be sweet? Moving from that one-time-buy to a short-lifecycle product may require a number of coordinated approaches, such as designing with common materials (see “Moving from One-time-Buy to Short-Lifecycle” sidebar). It also may require dramatically shortening the lead times, and supply chain financing can help with that. It is quite common for suppliers in the supply chain to have limited access to capital to purchase the raw materials they need ahead of time. This slows downs the whole process as they wait until they have the funds. Receivables financing can help them get those funds earlier. Even better is getting in-transit or pre-shipment financing based on firm orders received or some other pre-shipment milestone. When suppliers have access to these types of financing, they don’t have to wait until they have been paid before buying more raw materials, hence compressing lead times (provided they have a firm order in hand). But suppliers do not always have access to this type of financing at affordable rates. Trade-logistics-visibility platforms can help by providing lenders with detailed visibility into the status of various milestones in production, shipment, delivery, and inspection. Sometimes the event that triggers the transfer of ownership of goods (and therefore the payment) is not delivery at the customers dock door, but something further back in the process—anything from shipment out of the factory, to successful inspection at the destination port or other points in the shipment. Hence, by having near real-time visibility and access to documents confirming the achievement of milestones (e.g. successful inspection), instead of waiting for paper documents to arrive, banks can improve payment processing speeds, accuracies, and efficiencies. Figure 2 below shows some of the interactions that are possible between the networked platform and various players throughout the order-build-deliver-pay lifecycle. There are many, many more transportation/logistics-related and finance-related interactions and services possible in addition to what is shown below. Each logistics-visibility platforms provides a different set of services and not all of them integrate banks and other financial service providers. These platforms usually provide an accumulated history of past performance for suppliers—such as on-time delivery performance, quality records, etc. By having visibility into actual orders placed, production milestones, real-time in-transit visibility, inspection documents, proof-of-delivery, and suppliers’ performance records, banks and other lenders can offer suppliers lower rates on financing based on those orders, approved receivables, and past performance. Some financial service providers are also enabled to provide financing to suppliers or buyers for in-transit assets and/or VMI-based inventory. A few financial service providers will even take title to in-transit or VMI inventory, provided the buyer’s commitment to consume the inventory is legally indisputable. Descartes – Comprehensive logistics technology platform, supporting their Global Logistics Network with connections to over 6,000 companies. Descartes has many carriers and logistics service providers integrated into its network and a broad and deep array of transportation/logistics functionality, including routing/dispatching, mobile, and telematics. They provide the ability for buyers and sellers to send/receive purchase orders, advanced ship notices, invoices and remittance advices. But while they have had some forays into alliances with banks in the past, they do not have any alliances with banks currently listed, nor does Descartes appear to have integrated any financial service providers on the network. GT Nexus – Supply chain/logistics-oriented services (TMS and beyond) to a network of trading partners and service providers, with a strong connection with ocean carriers. They provide tracking and services throughout the order-to-payment cycle, similar to Figure 2 above. They have integrated a number of banks and financial institutes who provide services such as transaction processing, pre- and post-shipment financing, and inventory financing. There are several thousand companies connected to their network. MercuryGate – Primarily a SaaS TMS (Transportation Management Service) provider, with a network of connected carriers and 3PLs. MercuryGate does not provide financial services for payment between buyers and suppliers, but does enable 3PLs to provide visibility to their clients when goods are delivered which can be used by the client to initiate invoicing and/or recognize revenue. 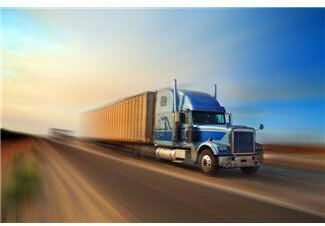 Also they provide services for audit and settlement of freight charges, and 3PL billing. TradeCard – A multi-enterprise collaboration network which started by providing trade finance services and expanded to included some sourcing, logistics (like electronic proof of delivery), and order management capabilities. Over 4,000 customers are connected to the network, as well as over 100 logistics service providers. Banks and financial institutions on the network provide trade services such as open account payment processing, payment protection, electronic invoicing, early payment programs, and trade financing. In Part 2C of this Platform series, we will describe some of the innovative financial services that are provided on networked platforms.